Right away in the brightly colored opening spreads, we learn that each set of parents has told the children they’re moving — the boy to Mexico City from the U.S. and the girl from Mexico City to New York. The children are unsure about leaving and note the things they’ll miss, each spread giving us a simultaneous glimpse of their lives. 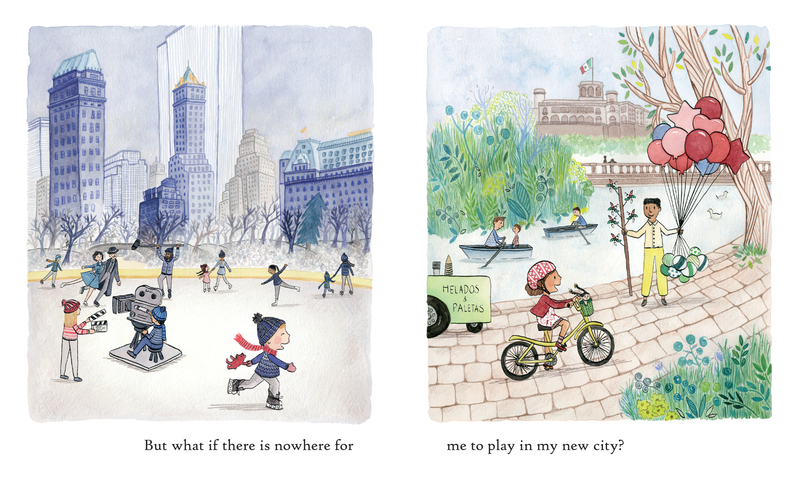 The children show readers their respective cities and the sounds and sights that they are reluctant to leave behind. For instance, one spread (“Cheering loudly for our team to win at the stadium”) shows the boy and his father at a U.S. baseball stadium on the left, but on the right we see the girl and her father at a soccer game on the right. By placing their narratives side by side, readers feel relief about the children’s anxieties: for instance, when the children fret about where they will play in the new city, we see the answer as we watch the girl and boy play in theirs, as they say goodbye and take in its wonders for a final time. I like how De Regil doesn’t avoid mentioning some flaws of each city. 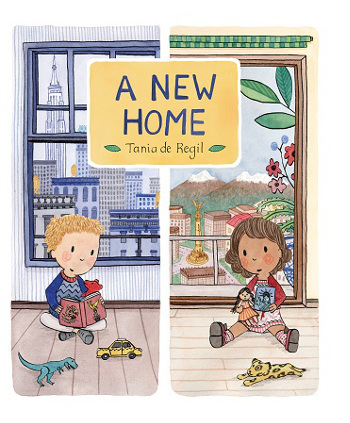 In one striking spread, we read that “my home can be hard on some people,” as the American boy and his mother pass a homeless man on the street, and the Mexican girl and her mother pass a homeless woman, giving her some money. 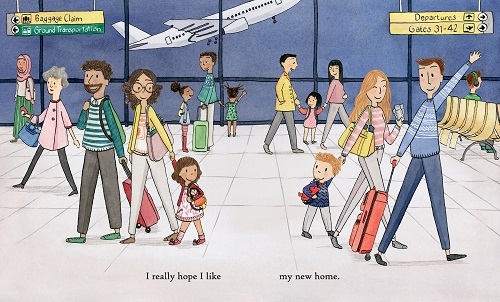 In the book’s closing spread, the two families pass one another in the airport — a sign of hope for each child, as they turn heads and smile at one another. The backmatter spread after this one notes information about both New York City and Mexico City. Thumbnails of each spread in the book are pictured with information about the culture, history, architecture, and more of each of these major cities. 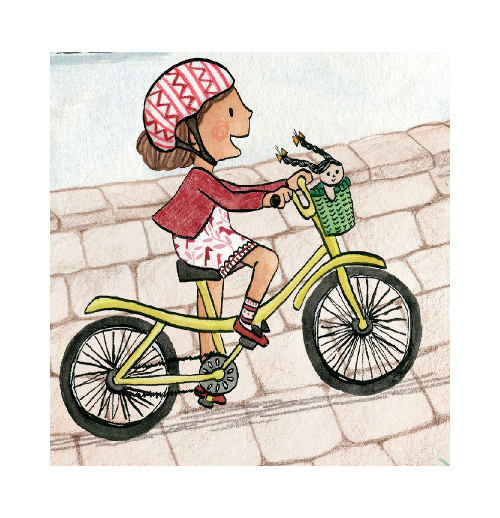 This is De Regil’s publishing debut in the U.S. She currently lives in Mexico City and often travels to the U.S. This book is also available in Spanish (Un Nuevo Hogar). This hopeful tale, perfectly suited for preschool and early elementary readers, shows us the common humanity in two cultures on two different spots on the map, while also showing us their unique offerings. A NEW HOME. Copyright © 2019 by Tania de Regil. Illustrations reproduced by permission of the publisher, Candlewick Press, Somerville, MA.